Playing in their first series in nearly a month, Ferris State went 1-1 over the weekend to place third in the last-ever Wisconsin Badger Hockey Showdown. In a battle between the Bulldogs, No. 11 ranked Ferris State was faced with a tough task in their opener against No. 8 ranked Yale. Yale began their night-long terror on Ferris State goaltender Taylor Nelson at the midway point of the first period, when Brian O’ Neill redirected a shot from Jimmy Martin. Just minutes later, Ferris State would answer back as defenseman Brett Wysopal passed the puck up ice to a speeding Blair Riley. Circling along the boards, Riley centered the puck to Casey Haines in the slot, who finished the play with a back-handed shot on Yale netminder Jeff Malcolm. The score would remain deadlocked at one goal apiece until a power-play goal by Sean Backman in the final minute of the second period restored the lead for Yale. Things would only get worse for Ferris State in the final stanza, as Yale registered four goals within an 18 minute span to finish with a 6-1 win. Nelson finished with 35 saves, while Malcolm had 23. 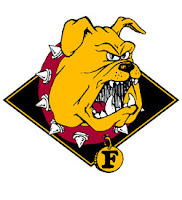 The following night, Ferris State had a much more pleasant experience in the consolation game against Merrimack. Just 7:24 into the game, captain Cody Chupp blasted a shot form the right faceoff circle to beat Warriors goaltender Joe Cannata. Garnering assists on the play were Riley and Haines. Later in the period, Riley finished off a pass from defenseman Matt Case to tally his team-high 15th goal of the campaign. Early in the second, sophomore Aaron Schmit would score his first collegiate goal to up the Bulldogs’ lead to 3-0. Down but not out, Merrimack managed to get on the scoreboard a few minutes later, as Adam Ross snuck the puck past Ferris State’s Pat Nagle. In the final period, Justin Menke and Zach Redmond both scored on the man-advantage to preserve a win for the Bulldogs. Cannata held a slight advantage in stops over Nagle, 26-23. Ferris State (14-4-2 overall, 8-2-2 CCHA) returns to league action this weekend when they travel to Notre Dame for a two-game set.